* start playing a random YouTube video and then type 1980. 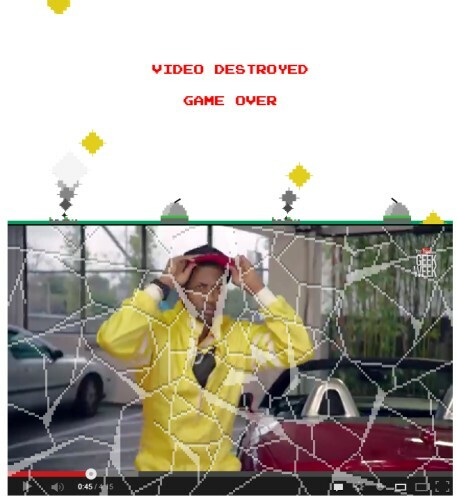 You'll need to defend the video and "blow those missiles out of the sky". * start playing a random YouTube video and then type 1337. Comments will be translated into the leet "language" and will look like this: "w0w th1z 1z pr3ttj﻿ $w33t". * open this video and click the POW! button from the player. The video now looks like a comic. * search YouTube for [Fibonacci] and you'll learn about Fibonacci sequences and the golden ratio from a YouTube animation that uses video thumbnails. * search for [ponies] and you'll see some cute ponies that are running. * search YouTube for [Use the Force, Luke] and you'll see a crazy animation. * search YouTube for [Beam me up, Scotty] and you'll see a Star Trek effect. "'Beam me up, Scotty' is a catchphrase that made its way into popular culture from the science fiction television series Star Trek. It comes from the command Captain Kirk gives his chief engineer, Montgomery "Scotty" Scott, when he needs to be transported back to the Starship Enterprise." This page shows all the Geek Week videos and a list of badges you can unlock. 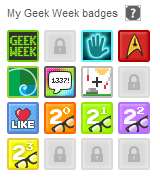 You need to find Easter eggs, take the Geek IQ test and watch videos to unlock all the badges. Follow YouTube's Google+ page for clues.